SAN FRANCISCO, CA--(Marketwired - Feb 20, 2014) - MooresCloud, an emerging smart home technology provider enabling 'Illumination-as-a-Service', today announced that the company is officially launching in the US. The team from 'down under' at MooresCloud is proud to introduce Holiday, a world-leading product which reimagines the way we use light to decorate our personal spaces. Holiday is a set of beautiful, intelligent, connected lights that delight people and enable them to create their own lightscapes. Putting the brains of a smartphone into each string of lights, Holiday has the capability to display countless patterns, drive animations, and run applications. Imagine lights in sync with your favorite music or the colors of your sporting team. After a successful pilot in Australia and New Zealand, we are pleased to launch sales of Holiday in the US, bringing the smart home revolution to everyone in an affordable and user-friendly way. Holiday reflects our design ethos at MooresCloud, which focuses on simplicity of design, ease of use and human connection. With built-in wifi, Holiday can easily be controlled by smart phone, tablet or laptop. When parents arrive home with a Holiday, children will be entranced and commandeer their parent's smart phone to make these beautiful lights come alive. Even if without a device, the simple onboard controller makes operating it a breeze. Users can even create their own applications using open source technology. As an innovative Australian start-up, MooresCloud seeks to design and manufacture delightful hardware, applications and services that make lighting easy to use, beautiful, intelligent, and interactive. 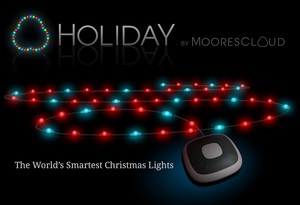 According to Mark Pesce, CEO of MooresCloud, "Holiday by MooresCloud features 50 full-color LEDs controlled by an embedded computer running Linux and connected to any tablet, smartphone or laptop and the Internet via Wifi. This takes the smart home in a new direction, with users able to interact playfully with our lights by using the MooresCloud apps for creative expression." As part of our US launch, MooresCloud is delighted to announce that the company's pre-order sales partner is theNew York-based Grand St, a curated shop for creative technology. They hand-pick, test, and highlight well-designed hardware from independent producers. MooresCloud is proud to introduce Holiday, a world-leading product which transforms the way we use light to decorate our personal spaces.